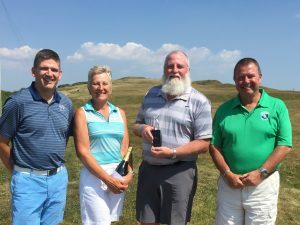 A large field took to the course in beautiful golfing conditions, and the scores certainly reflected this, with plenty of players beating their handicap. Winning the overall trophy with a superb 46 points was Al Richard, with his playing partner Russell Macgregor taking 2nd place on 44 points. Third place was Gary Dobson on 41 points. Best of the Ladies was Di Clark, scoring 41 points, with Sheila Richard taking 2nd place on 37 points. Dennis Smith proved that age is no barrier to good golf shots, as the oldest competitor in the field (83 years young!) took the Nearest the Pin prize. Ray’s son, Chris Cooke travelled over from the mainland to play in the event, and also provide the prizes for the day.